a major top may be in place. 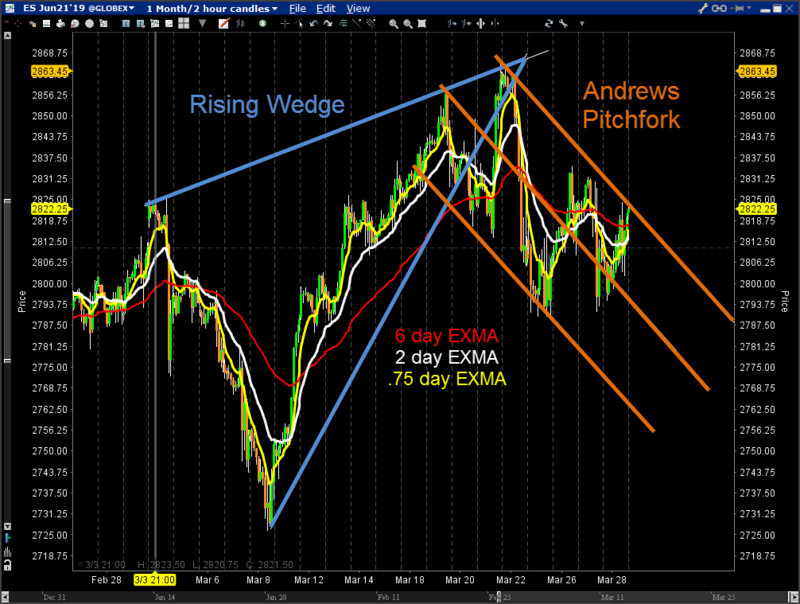 Wedge pattern. Then on March 22nd, prices dropped sharply, to make a lower daily low. From that point until present, the S&P has formed an Andrews Pitchfork pattern. 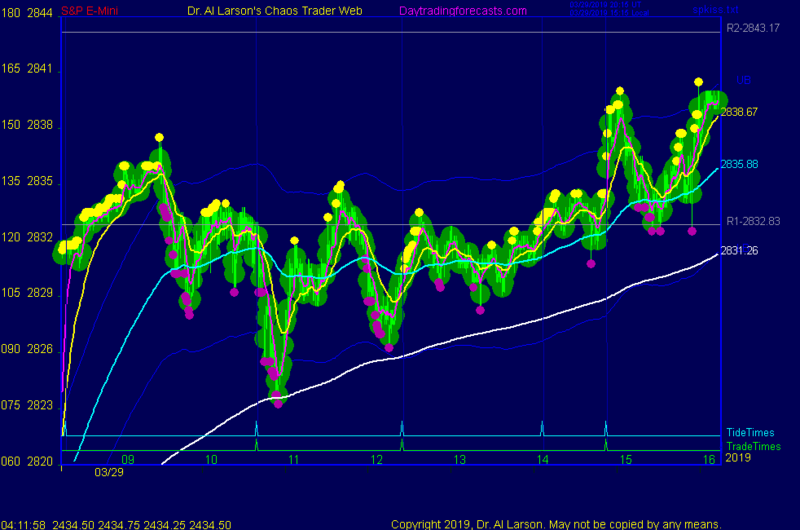 During the formation of this top, the 6 day EXMA had turned down, but not sharply. the vicinity of 2700 is possible. Spring Equinox of 2019. This is an example of a natural seasonal cycle. does develop, the S&P can be expected to make 7 moves in a down Chaos Clamshell. 3/29/2019 1:28:12 PM MT Al****:: from the high, I see 1, 2, 3, and 4. 4 peak was 8 calendar days from the high. 3/29/2019 12:57:06 PM MT gg:: It did it. 3/29/2019 11:52:57 AM MT Al****:: I think I'm done. Thanks for coming. See you next week. Take some courses. 3/29/2019 10:38:25 AM MT Al****:: LOL:) I have had many too, but never claiming to be me! 3/29/2019 10:38:19 AM MT jvj****:: By the way, I wasn't driving at the time. 3/29/2019 10:30:49 AM MT Al****:: crazy-just had a call on my business phone spoofing MY NAME and claiming it was Microsoft calling! Obvious scam. 3/29/2019 10:14:21 AM MT jvj****:: Good morning everyone. 3/29/2019 9:50:44 AM MT RR:: rvb, sorry busy trading options.I've been utilizing MMT for past 10 year in conjunction with http://eminiforecaster.com/members/membersblog/forecaster.php http://marketmaptrader.com/members/platform.php EMF is weekly forecast from same group of traders. doesn't need a lot reading and about 80% accuracy rate. I'm not sure if you can open up the links. 3/29/2019 8:12:25 AM MT gon:: Hello everyone. Al, today's AUX article is published as always: https://www.fxstreet.com/author/dr-al-larson-phd Many thanks! 3/29/2019 6:43:08 AM MT RR:: GM all.